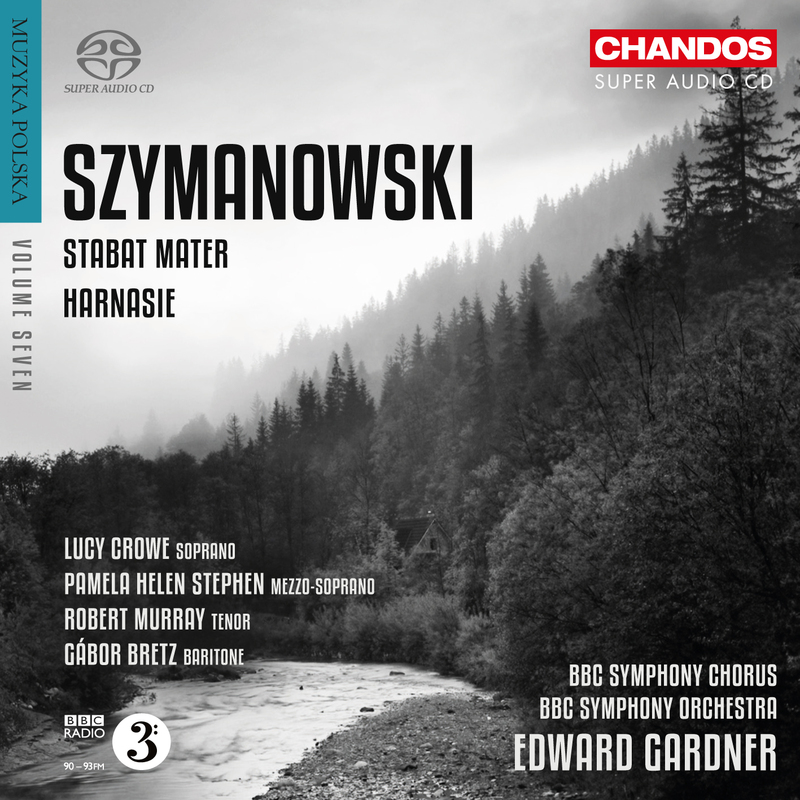 Eight months after its first Szymanowski CD with the BBC SO under Edward Gardner, Chandos has issued the second volume, combining two works from the composer’s ‘Polish’ period to go along with Louis Lortie’s brilliant recording of the Symphonie Concertante on vol.1. Although I’ve not heard the new CD yet, I’m expecting equally fresh and vivid accounts of the Stabat Mater (1925-26) and the ballet Harnasie (1923-31), not least because of the addition of the BBC Symphony Chorus and an excellent raft of singers. These include Lucy Crowe, who sings so beautifully on Chandos’s CD of Lutosławski’s vocal works (2011). As a counterpoint to the increasingly saccharine carols that flood Christmas here in the UK, here are two unvarnished examples from the Polish highlands. Each brings an edgy reality to Christmas traditions. The first is from Pieniny, on the Dunajec river north of Zakopane. It’s one of Poland’s favourite carols, ‘Oj, maluski, maluski’ (Oh little one, little one), sung here by a young child, with male-voice refrain. There’s a charming little video loop accompanying this ungilded rendition. This lively sequence was taken from an evening’s carousel in the Willa Orla (Eagle Villa) in Zakopane on 26 December 2007. It’s vigorous, youthful and passionate. OK, it’s been packaged a bit, but once inside you get a good feel for the atmosphere of góral celebrations of Christmas. Wesołych Świąt! I had not intended to post so much on Górecki over the past few days, but events and memories have rather taken over. 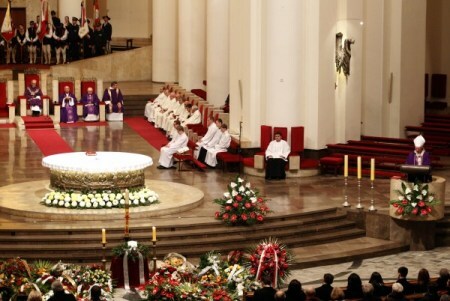 Not least of these are my recollections of the funeral, which took place in Katowice on this date last year. I hope that my account below will give some sense of the occasion. I caught an early train from Warsaw along with Polish friends and colleagues. The cloud hung grey and dismal over the central lowlands. Katowice looked the same as it had two weeks earlier, when I’d come to see Górecki for what turned out to be the last time. Katowice, too, was grey and dismal, but then it often looks that way. There was time for a reviving cup of tea and a sandwich, time for my friend to collect a bouquet, and time to buy the new edition of Tygodnik Powszechny, which had published my appreciation of Górecki along with those of others. We walked to the Arch-Cathedral of Christ the King, whose huge dome sits squatly atop the cruciform building. The dome should have been higher, but the post-war communist authorities did not want a Christian building dominating the area. It was just as well that we arrived early, because the Cathedral was packed long before the scheduled start at 13.00. 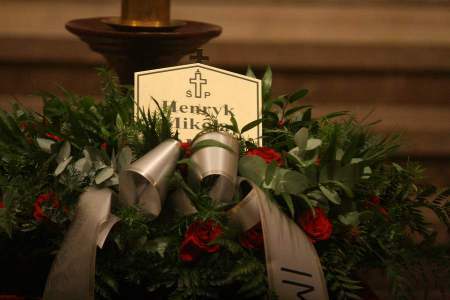 Górecki had been cremated the previous day, in a private ceremony. I was told that the Roman Catholic church in Poland barely tolerates cremation and would not countenance a funeral service beforehand, which is customary here in the UK. (I recollect that, in 1994, Lutosławski’s ashes were brought to the chapel in Powązki Cemetery in Warsaw for the funeral service. He had been cremated in the (then) only crematorium in Poland, in Poznań in the centre of the country.) 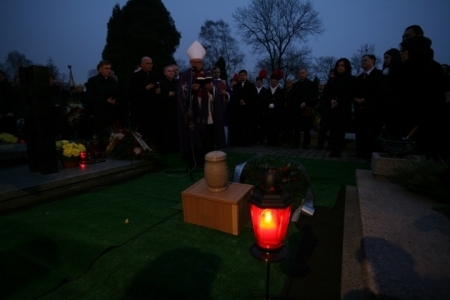 Urns are always buried, as the scattering of ashes is illegal in Poland. Most of the close relatives, including his daughter Anna and her family, arrived at 12.45, his widow Jadwiga and son Mikołaj on the dot of 13.00. They were followed by the funeral directors bearing wreaths and Górecki’s funeral urn, which was placed, gently sloping, on its back, with a large central candle behind and the funeral plaque in front. The ceremony was in two parts, designed to last about two hours. Almost inevitably, it overran, by almost an hour. First there was a concert, then the service proper. The musical institutions of Katowice and further afield had pulled out all the stops. Górecki’s former pupil, Eugeniusz Knapik, who is the senior figure at the Academy of Music in the city, where both Górecki and he studied, had played a key role in bringing everything together. 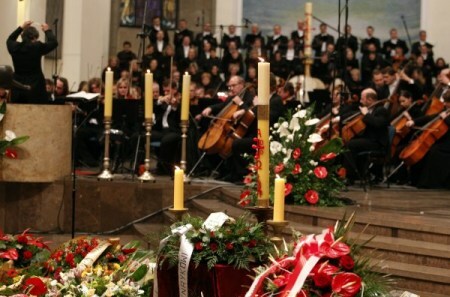 Three of Katowice’s orchestras performed – the National SO of Polish Radio, the Silesian PO and the AUKSO CO – alongside soloists and choirs from Katowice and Kraków. The concert began with Szymanowski’s Stabat Mater, a work with which Górecki had a deep affinity. Unfortunately, the Cathedral has a ballooning acoustic with a reverberation time of almost 10″. The a cappella fourth movement, however, sounded well. There followed a performance of Górecki’s Beatus vir (1979), the last of the three monumental works that he composed in the 70s – it had been preceded by the Second Symphony ‘Copernican’ (1972) and Third Symphony ‘Symphony of Sorrowful Songs’ (1975). It sounded as strong and imposing as it must have done at its first performance, which Górecki conducted in Kraków in front of the newly elected John-Paul II. The mass, which began at 14.15, was presided over by Cardinal Franciszek Macharski, a close family friend. There were addresses by other church figures, by the Minister of Culture and by the President of the Polish Composers’ Union. In the congregation were composers of Górecki’s generation – Krzysztof Penderecki (Kraków) and Wojciech Kilar (Katowice) – and younger ones too, including Górecki’s pupils Knapik and Rafał Augustyn. As far as I am aware, I was the only person from abroad, which I found rather sad, given how significant had been the relationship between the composer and major broadcasting, concert, publishing and recording institutions outside Poland. There were a couple of musical surprises too. A performance of Totus Tuus was to be expected, but Penderecki conducting Amen was less so. And I was not the only one to be taken unawares, at the start of the communion service, by the performance of an excerpt from Strauss’s Metamorphosen. According to his widow, this had been the one musical request for his funeral that Górecki had made. The ceremonies came to a close at 15.45. This must have come as a blessed relief for the representatives of organisations from Katowice and the Polish mountains who had stood with their banners at the far end of the Cathedral for the preceding three hours (see the photo above). They now moved down to the aisle, leading the procession out of the main doors. Górecki’s oldest grandchild, still in his mid-teens, carried the urn, flanked by his father and his uncle. Then began the walk to the cemetery. It took some 15′ for everyone to leave the Cathedral, and by this time dusk was falling fast. We proceeded slowly up the side street, just a few hundred metres, and into the cemetery, but such was the crush of people that I had to look on from some distance. 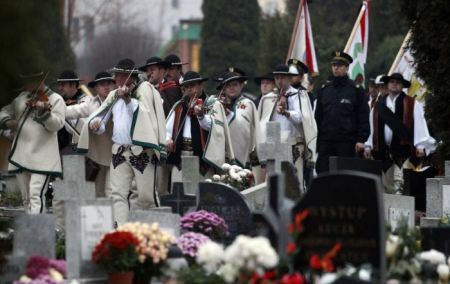 En route, a miner’s band played solemn music and the urn was carried in relay, concluding with a trio of mourners from the mountain town of Zakopane (also carrying the plaque and a heart-shaped carved box containing soil from the mountains). Most of Górecki’s happiest moments had been spent in this region since the late 1950s. He honeymooned there and for many years in the 1970s and 80s rented a log cabin in the little village of Chochołów, before finally buying his own house in the 1990s in the village of Ząb, on a high ridge facing the magnificent jagged peaks of the Tatra Mountains. He revelled in the views and the culture of the place. At the graveside, further prayers and blessings were said, the urn placed in the ground and the mountain soil poured over. There was then a patient wait to greet the family, a process further lengthened by the many mourners who carefully placed their wreaths and bouquets, creating a waist-high bank of flowers around the grave. I became aware, beyond the low murmuring about me, of distant music. It seemed familiar. 50 or so metres away, indistinguishable in the shadows, was a folk kapela, a string ensemble from the mountains. They were playing a melody from the Tatras, keening and unbelievably poignant. Earlier, they had walked from the Cathedral in daylight. Now, they were paying a final tribute to their adopted son as night closed in. Father Krzysztof Tabath, the hospital chaplain for Katowice-Ochojec, … came to the hospital half an hour later than usual. At my request, he movingly described those last moments: “Eventually, I reached Mr Gorecki. I began with “Our Father”, then “Hail Mary”, and then “Soul of Christ, sanctify me” “. And there, the whole time, above the bed, were flashing the monitors to which my husband was connected. During the saying of the prayer the display panel gradually dimmed, then went out altogether, and he died. During the prayer, he had crossed over into the other world. I cannot imagine a better death. It was simply wonderful. I am happy that it was like that. When Jadwiga told me the story, she added the resonant detail that Henryk had died as the priest uttered the final ‘Amen’.